Two recently escaped convicts meet up with a group of gangsters who are taking them to safety. After a disagreement regarding a female hostage of the group, one of the men decides to make a run for it, through the woods to freedom. However, these are no ordinary woods. The “Forest of Resurrection” has the power to bring the dead back to life. What follows is a fight for survival between the convict and his female companion and the men chasing them. In a later twist the man realises that there is a reason why he has been brought back to this particular forest as an ancient adversary returns. Written by Ryuhei Kitamura and Yudai Yamaguchi the script is a ridiculous blend of Yakuza and Zombie film tropes. The majority of the runtime is dedicated to the action sequences that are the film’s major strength. Essentially a series of fights that are loosely contrived through various characters happening upon one another, there is enough variety to keep them fresh, especially with the zombie element thrown in. The film doesn’t shy away from violence and fans of gore will not be disappointed with the bucket loads of blood, and practical effects for gunshots and other injuries. Decapitation, dismemberment, punching a hole straight through a zombie: all of these are commonplace in a film that doesn’t take itself too seriously. There are moments of intentional slapstick and black humour that lighten the tone. The main issue with the film is that it never quite manages to draw you in on an emotional level, for the most part being surface action and violence. Kitamura’s direction does keep things entertaining, with stylish 360-degree shots, lively editing and some fantastic framing that elevates the film above its basic story. The actors are all well cast and bring their eccentric characters to life, doing a great job with the fight choreography as well as the comedic beats. 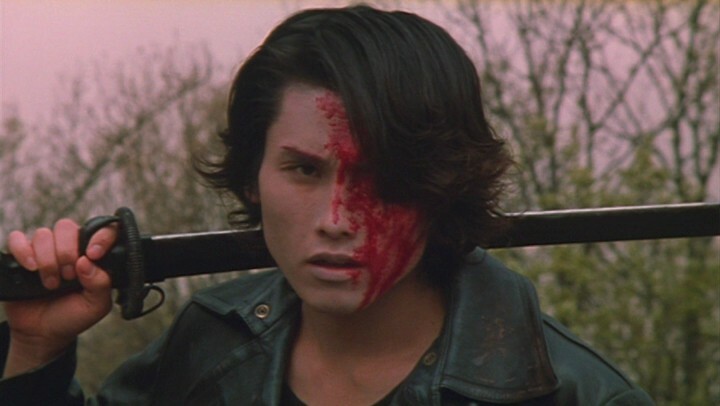 “Versus” will appeal to fans of zombie films and the more bizarre yakuza movies, complete with jokes about missing hands, liberal use of violence, increasingly ridiculous guns employed to blast characters out of situations. The film’s own self-awareness of the silliness of its premise along with skilful and stylish direction make this worth a watch for fans of the genre. While there is very little to appeal on a dramatic or story level, the action scenes, with great choreography and practical effects, make for a fun distraction.